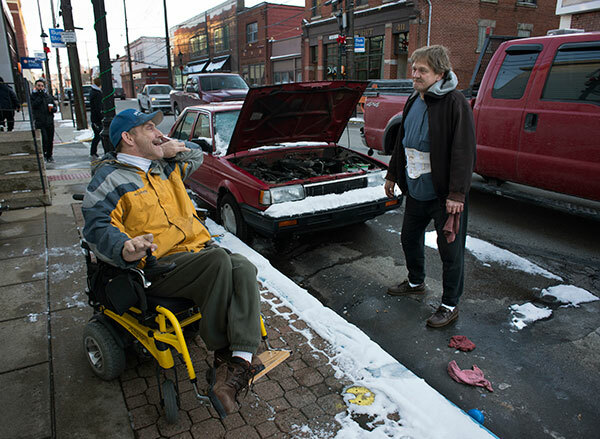 MILLVALE — Bob Norris zips down the bus’s metal ramp in his motorized Steelers wheelchair as his wife, Tina, emerges with a jolting gait. Bob lingers in the aisles, hoping to chat up the friendly store manager. His slurred speech doesn’t prevent him from making new friends. It’s part of their system, designed not to delay other shoppers. Each tries to fill the gaps where the other one falls short, doing their best, not always succeeding — just like any other couple. They’ve been married for 22 years. That just wouldn’t do for Bob and Tina. 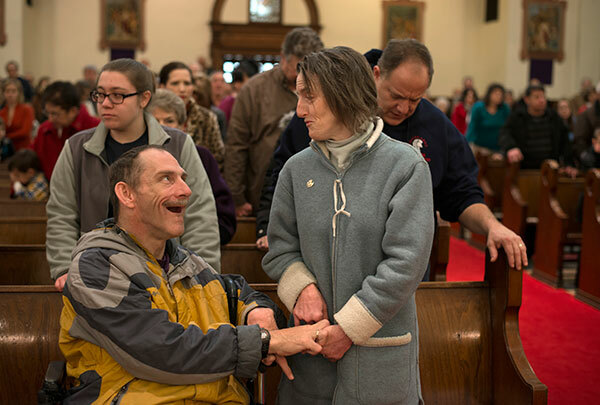 The pair met at Allegheny Valley School, a nonprofit that serves people with disabilities. It was Memorial Day about four years later when Bob’s relatives helped him navigate his rigid body to one knee in his mother’s kitchen. Bob’s mother, Pat, was relieved he found Tina, she said during her shift at Yetter’s Candies in Millvale. The mother of another son who is deaf and doesn’t speak, she was worried Bob’s disability would keep him from love. The Norrises don’t have children. Tina, 44, says people sometimes ask why. “Sure, I’d want a child with my husband, but if I can’t do for myself, what can I do for my children?” she said. “The disability-rights movement makes people feel they can achieve their dreams,” she said. They enter from the parking lot off a side street. The lot’s driveway is so steep that cars bottom out, yet Bob and Tina take it on foot or wheelchair on a daily basis. A police scanner hums under the living room’s lone window. “It’s a bad habit,” Bob, 48, said. His father was a fireman in Millvale, and the scanner is a soothing reminder of him. A caregiver comes by Monday through Friday — two hours in the morning, three hours in the afternoon. Her name is Nancy Coban. She is 71, lives down the hall and happens to be Bob’s aunt. She has permed hair just like Bob’s mom and his other aunt, who take over caregiver duties on the weekend. Nancy leaves after the last bite. She’ll be back to serve lunch to Bob once Tina leaves for work. Tina clears the plates off the table and washes the dishes. She fumbles with every glass and plate. It doesn’t matter that it would take the caregiver half the time. It’s her household to keep. “It was hard for Tina at first, another woman touching all her stuff,” Nancy said. For nearly 21 years, Tina has held pretty much the same job at Achieva Mailing and Lettershop Services in the Strip District. A few dozen employees, many of whom also have disabilities, do similar work side-by-side nearby. Tina works at the lone corner desk, and she doesn’t take a lunch. “She’s very personable, but she focuses on her work,” said Jodi Barber, a production manager. “She gets upset that it’s the only job she has and that she can’t do it faster,” Barber explained. “They look over my disability and I always try my best,” she said. “They let me work there. They could have hired someone who could do it faster. About 325,500 disabled working-age Pennsylvanians are employed, only 21 percent of that population, according to the Census Bureau’s 2012 American Community Survey. The couple lives on Tina’s paycheck and Social Security Disability Insurance, a total of less than $1,400 a month. “We’re making it, we’re paying the bills and we’re buying our own food,” Tina said. For example, when two recipients of Supplemental Security Income [SSI] marry, their benefits are 25 percent less than if they remained unmarried, according to the 2014 federal payment amounts on Social Security’s website. A bill proposed by Arizona Congressman Raúl Grijalva in April 2013 would increase and annually adjust the amount of income and assets allowed to be eligible for SSI. It’s unclear how many of the estimated 1.7 million disabled Pennsylvanians are affected by the so-called “marriage penalty.” The state does not track marriages of people with disabilities. Some of Bob’s vigor stems from a childhood memory when accessibility wasn’t yet a buzz word. The wooden ramp his father built to get him over the stoop into his family home was taken away as garbage. “He’ll go to borough meetings and just fight up and down with people about curb cuts,” Snook said. Neighbor Dion Evans came to know the couple through conversations on bus trips or while wrenching away on his mother’s 1987 Nissan Sentra. He had trouble understanding them at first. Most everyone responds in kind. “Hi, baby, how’re you doing?” a gas-station patron called out one day. There are still instances of boorishness. Schoolchildren sometimes stare; a man in a hard hat was visibly exasperated that he had to step into the road to get around Bob’s wheelchair; and a businessman’s snub was capped with an eyeroll.